신개념 퍼즐게임 트리플 타운 with BAND! 밴드게임에서 새로 태어난 트리플 타운을 즐겨보세요! 왕국의 북쪽 땅이 다~ 없어졌어요 !! 친구들과 함께 떠나 새로운 마을을 건설해 주세요! 그렇게 시작된 마을 건설을 평안할 줄 알았지만..
* 트리플 타운은 같은 모양의 재료 3개를 합쳐 상위 재료를 만들어 나가는 게임입니다. * 가장 높은 건물은 트리플 캐슬입니다. * 4개 이상의 재료를 합치면 특수한 이벤트가 발생합니다. * 방해물인 돌이나 곰들도 모으면 보석상자를 얻을 수 있습니다. * 타임어택 모드를 진행해 골드를 모을 수 있습니다. * 타임어택을 하기 위한 하트는 20분에 하나씩 충전이 됩니다. * 친구에게 턴을 보내면 나에게도 턴이 추가 됩니다. * 상점에서 판매되는 펫은 특별한 능력을 갖고 있습니다. * 카페에서 친구를 찾아 추가할 수 있습니다. New concept puzzle game Triple Town with BAND! Band game Triple Town and enjoy a new born! The land north of the kingdom - gone! To build a new town with friends, please leave! 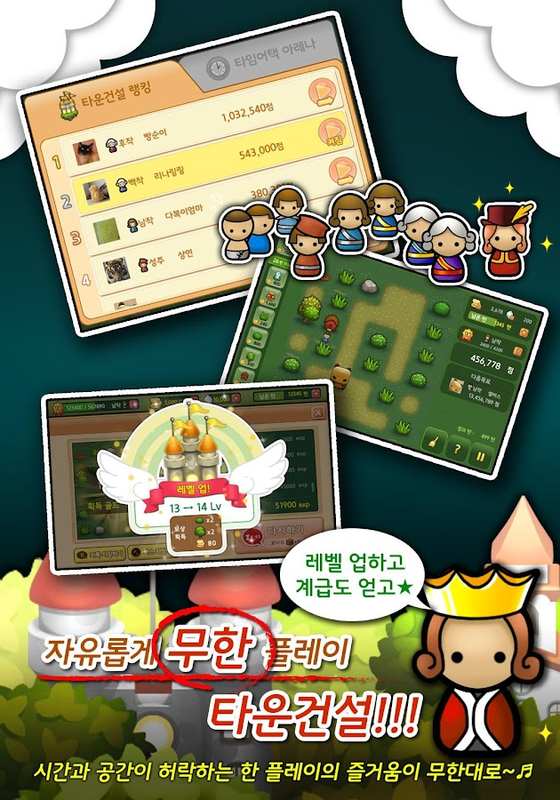 * Triple Town is shaped like the top of the ingredients together 3ingredients to make the most of the game. * It is the tallest building in the triple Castle. * Together with four or more ingredients that particular eventoccurs. 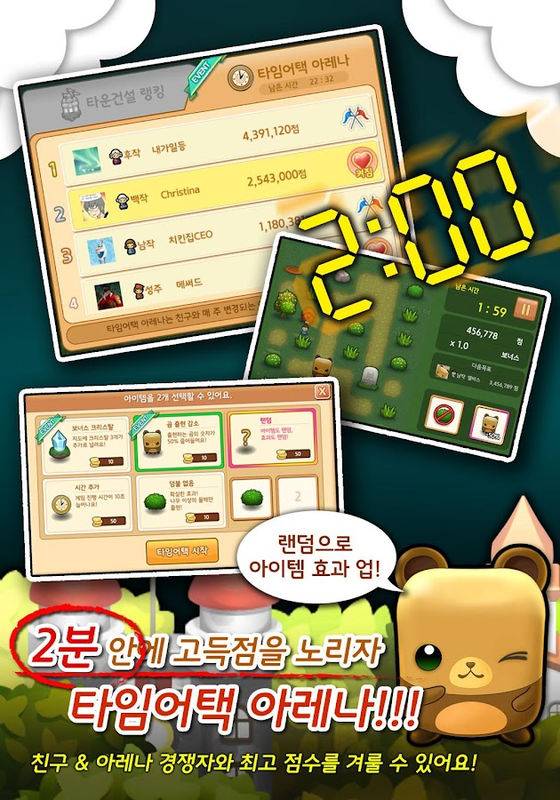 * Collect obstacles stone and bears also can get a jewelrybox. * Time Attack mode, you can collect gold to proceed. * Time Attack for 20 minutes for the heart, one will becharged. * If you send me a friend who turns will be added to theturn. * Sold in pet shops have the ability to be special. * Cafe, you can find and add friends. Edge Magazine’s Game of this year!Gamasutra’s the best social game!5 ratings from Gamezebo! The best facebook game!Today’s App selected by Eurogamer!New concept of the puzzle game Triple Town!Let’s play Triple Town newly launched with your friend!Northern land of the Empire has vanish away! 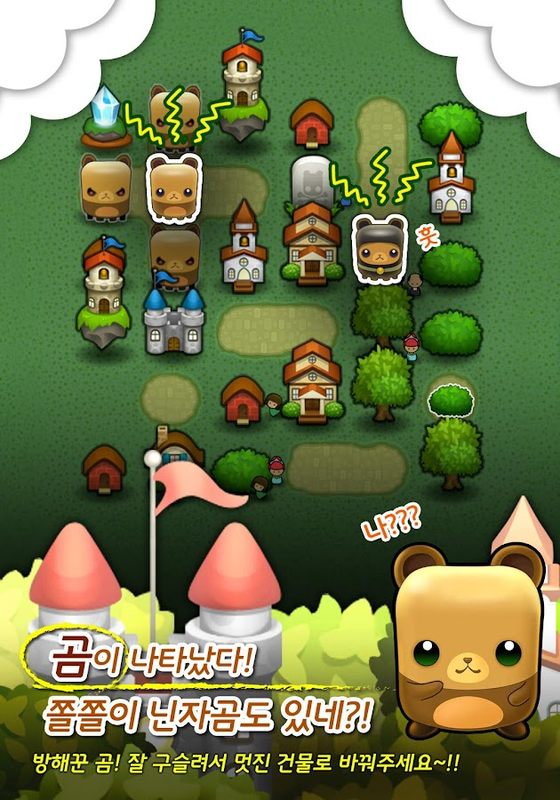 !Let’s build a new town with your friends!We support material to build a town~It seems building the town goes well without any problembut….Oops, a bear appears! * You can combine 3 same shaped materials and create newones(superordinate one). * Collect the materials to build a structure and finally buildtriple castle which is the best building by collecting each 3structures. * Combine over 4 materials then special event will begenerated. 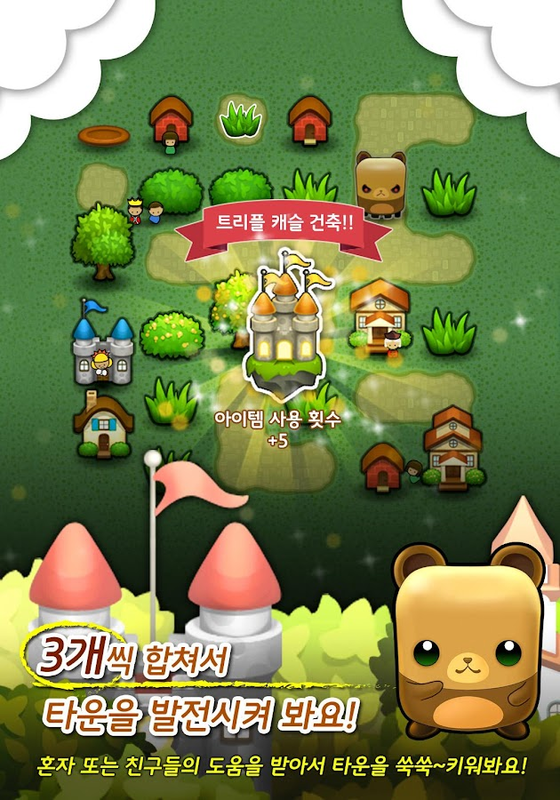 * Collect Obstacles, Stones or bears, and get a jewel box. * You can gather the Gold by playing Time Attack mode. * A hart needed to play Time Attack mode is charged every20mins* Send a turn to your friend then you will get more turns aswell. * Increase your rank and get additional benefit. check your ranknow. * Pet sold in Shop has a special ability. Alphabear is an original word puzzle game by Spry Fox, thedeveloper of the award winning game Triple Town.In Alphabear, youspell words by selecting letters on a grid. When you use lettersthat are adjacent to each other, bears appear! The more letters youuse, the bigger the bear gets, and the more points you earn!Whenyour score is high enough, you'll also win a bear for yourpermanent collection. These bears can be used as powerups in futuregames! They increase the points you earn, extend your timer,increase or decrease the frequency with which letters appear on thegame board, and more. 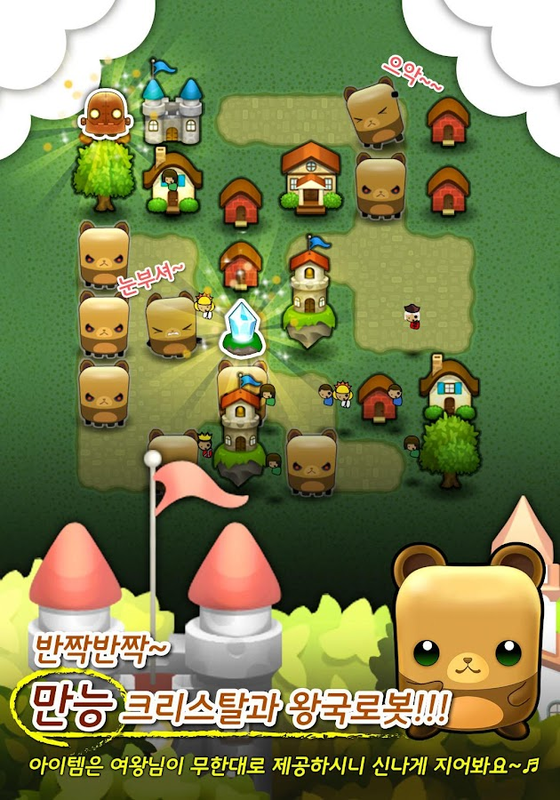 === ROOT IS REQUIRED FOR THIS APP ===PROMO: One SAVE GAME with 100000 coins in-game worth US$10FREE!Triple Town is an original puzzle game in which you try to growthe greatest possible city. The larger the city you build, the morepoints you score. You build your city by matching three or moregame-pieces: combine three grasses to make a bush, three bushes tomake a tree... until you've filled the board with houses,cathedrals and castles. Along the way, you'll have to outwit giantbears who will try to block your progress.Have you ever wanted to save your in-game progress in TripleTown by Spry Fox LLC before making a move and then able to reloadthe game again?Now you can with SaveMyBears!SaveMyBears will allow you to have UNLIMITED save games forTripleTown!Try different strategies at different points of the game, go backto a saved game any time you want!Supports all known version of Triple Town.Instructions:1. Start SaveMyBears.2. Tap the first save game "SaveMyBears" to load the free save gamewith free coins!3. Play the game as per normal4. Quit Triple-Town and save the game progress usingSaveMyBears* NOTE: MUST QUIT Triple-Town by pressing back-button. Do not usehome button!5. Load any save game any time you want!WARNING:1. Loading a save game will overwrite all game settings such ascoins, high-scores, etc!2. Always ensure Triple Town is not running by pressing back buttonin Triple Town and Triple Town will save current game progress. HexaCity is an enhanced and addictive strategy puzzle game withcity-building elements. It comes with an 3D isometric map andallowing hexagonal matching with all six adjacent cells. It givesunlimited moves.By matching three or more of same buildings inadjacent cells, it will turn into a new building with higher level.The game ends when your city filled all available plots of theisland. This app is free and no-Ads. Let's build a megacity on theisland!